I gotta get around to doing this with my goshuuin-chos. The one for Chugosonshi-ji is nice and easily identifiable. I like that in a goshuuin. There is only so much memorizing obscure brush strokes I can manage before they all go falling out my ears. 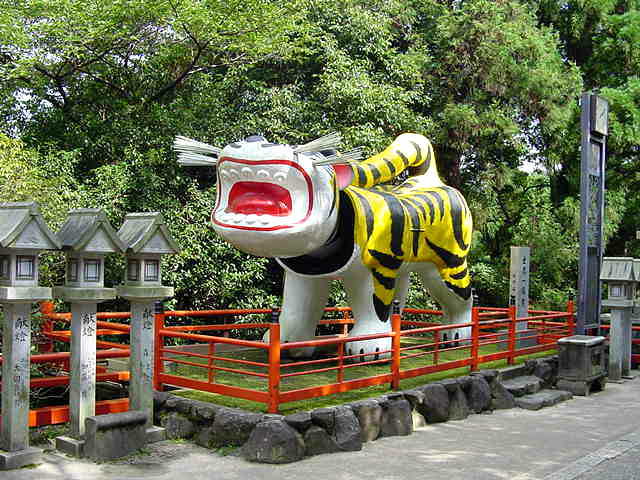 More with the why I'm going to have to go to this temple: goma tora are fundamentally cooler than goma inu. They may even be cooler than the rats at the Rat Shrine. Though I'm going to have to go to both places and check them out to compare. This temple, by the way, was the first one in Japan to be dedicated to Bishamon-ten. (And for that alone it would have to be on the list of Temples To Visit.) It was built by Prince Shotoku (who must really have liked the area, since Houryuu-ji is one train stop down, where Prince Shotoku resided for a while), which means the likelihood of buildings that are over 1300 years old is pretty high. Yet more reason to visit. 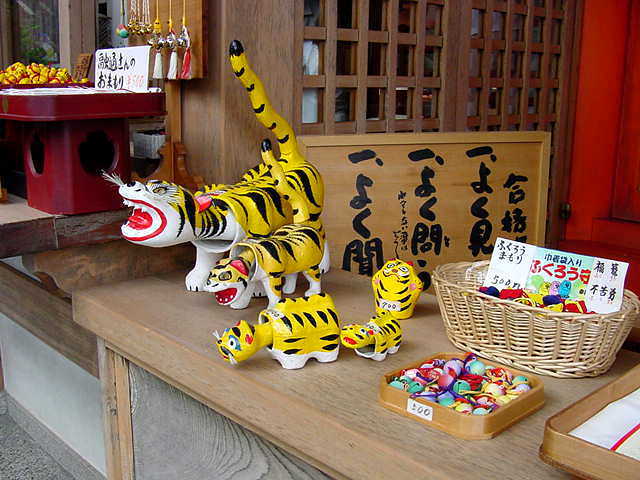 I've seen a bunch of different stories about what happens at this temple in the year of the tiger on the day of the tiger and the hour of the tiger. They all agree that it is Most Nifty. 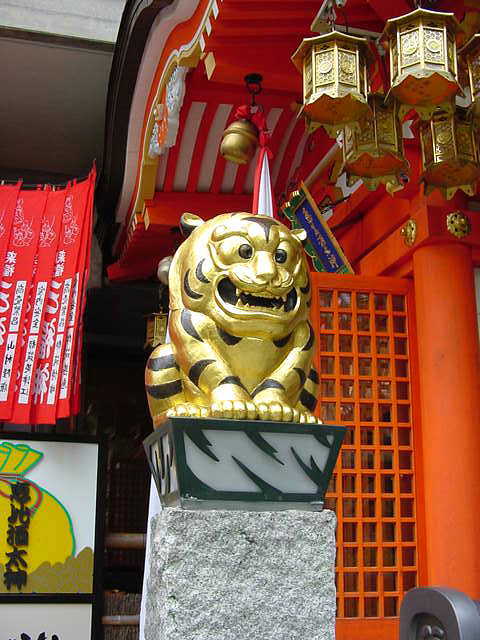 Hence, the temple's overwhelming fondness for the tiger motif. The tiger's year won't come up for several more years, so the probability of me visiting on the right day is low. Ugh, it looks like the post marking Shigiyama Castle is a 30 minute hike up the mountain. ... Do I really wanna walk that far just to look at a post? I mean, maybe if there were some rocks around or something...? Just for my future reference, Kinki area castles. 'Scuse me, must go get sidetracked by Yamato Kooriyama-jou. There must be more to it than what we saw when we were there... (Well, I know there was more to it. I just couldn't figure out how to get there without swimming the moat and scaling some walls. Not what I wanted to do in the middle of winter...) Uh, yep. Lots more. Didn't see. Must go back. Heart forever broken. Whatever. And while on the topic of heart, broken: words cannot describe how much the second picture down here annoys me. Why have I never seen this sign? Do you know how many times I've been to Nara, and I have never seen this sign? (Come to think of it, do I know how many times I've been to Nara??) At any rate, this castle is just around the corner from Todaiji. This annoys me, since, well, it's just around the corner from Todaiji. I've been to Todaiji lots of times. I've never been to Tamon Castle. This must be fixed. I must also share that link with Jan, so that she too may go "argh, why have we never seen this sign before? This Must Be Fixed." Since, really, I like to share the pain. *kicks Google* Enough with the Chinese pages. I try to find places in Japan and all you give me are pages in Chinese. When have I ever done a search in Chinese? Huh? Never, you say? Why, yes. Never would be correct. This is large because I. Don't. Speak. Chinese. Comprende? Okay, that's enough for tonight. Must go get some sleep. Ooh, I see what you mean. I hadn't noticed him before. Oooh, a star festival! ^_^ Does Google have a search option that would block certain pages, like ones that are in Chinese? When I notice that it's all coming up in Chinese (which annoys me because it takes a minute to determine that no, in fact it is Chinese and not just a lot of name-heavy Japanese) then I switch it to only show pages in Japanese. This is better, but it does exclude pages in English which I would like to see as well. So if I care to get the English pages I have to run two searches. Given that Japanese input on a US keyboard is a little inconvient, this amuses me little. Google used to know that I do my searches in Japanese and wouldn't default to doing searches only in Chinese. I'm kinda perplexed that it's suddenly changed that behavior.